What is the purpose of Brake and Lamp inspection? 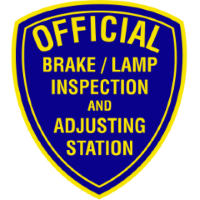 In the state of California Brake and Lamp inspection is necessary to ensure that a vehicle is safe to drive and operate properly on the public roads. Brake and Lamp inspection are required anytime a vehicle is being salvaged and retitled. Brake and Lamp inspection is a safety issue. Here at Auto Plus, we issue a certificate for Brake and Lamp inspection for passenger cars. Auto Plus is California State Certified Brake and Lamp adjusting station.